Is this the start of the internet of things? The download is dithering, but is streaming music all it's cracked up to be? Free or subscription-based services like Spotify, Deezer, Rdio and Pandora are all great, but they're mostly either stuck on your smartphone, your desktop computer or your games console. Add radio stations and podcasts to the mix, and sharing a stream between devices isn't easy. Nor is sending streams to a hi-fi, with even high-end (and closed) multi-room music systems dependent on Wi-Fi, and so suffering from buffering, delays and out-of-sync stereo streams. The whole thing's a mess. What we need is some kind of unifying technology that accepts streams from anywhere, sends it to anything, and keeps everything synchronised and in top quality. Could that technology be Caskeid? 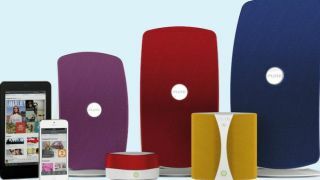 Caskeid, for now found only on Pure's Jongo speakers, is largely about making wireless music as dependable as cabled, therefore cutting away a Wi-Fi network's inherent latency. Is this a wireless multi-room audio streaming technology only? "We talk about multi-room, but increasingly modern homes are open-plan, so we're really talking about multi-space," says Tony King-Smith, VP of marketing at Imagination, which created Caskeid and owns Pure. "A low-latency system means there's no issue with adding speakers." You basically hear music without the artefacts that out-of-sync audio channels currently bring. Why is Caskeid so important? A key feature of Caskeid, as shown in its implementation in Pure's Jongo speakers, is that it can help foster a new era of inter-operable speakers, as opposed to closed, single-brand, multi-room audio systems. Onkyo is one of the first companies to license Caskeid, so its upcoming products (possibly a mini hi-fi, powered Wi-Fi speakers or its traditional range of AV receivers) will be usable in the same system as Jongo speakers. However, Caskeid is available to license by any manufacturer; its core latency-killing technology is of just as much use to a closed system as an open one. "The promise of Wi-Fi has been there for a long time, but until now it's been less than satisfactory," says Jeremy Silver, ex-EMI and Virgin Records music industry executive, Advisor to the UK Technology Strategy Board and author of Digital Medieval: The First Twenty Years of Music on the Web ... and the Next Twenty. "Caskied has convinced a lot of the industry, but having solved the latency issue you've still got the problem of Wi-Fi dropouts. Caskeid only solves one of the problems with wireless audio." Onkyo's involvement is a clue. "This is audiophile-quality low-latency synchronisation thought through to the very lowest level," says King-Smith. "The latency is so well controlled that the human ear can't detect it." Nor are formats a problem for Caskeid. "The beauty of Cakseid is that it doesn't matter what the audio decoder is, so you can throw any format at it, including lossless files like WAV and FLAC," says King-Smith. "That's the direction for the future." For now, what formats are handled is up to the manufacturer. However, as well as quality and rock-solid synchronisation, Caskeid – in its Bluetooth Caskeid guise – is all about convenience. Bluetooth Caskeid lets you send any audio app content to multiple Caskeid-enabled speakers through a unique combination of Bluetooth and Wi-Fi. It's actually really simple: a Pure Jongo speaker acts as a simple Bluetooth speaker and can stream music from your phone, whatever the source. It's Caskeid that allows it to use a home's Wi-Fi network to send that audio – perfectly synchronised, of course – to other speakers. The result is instant multi-room from any source. "With Bluetooth Caskeid you can use any stream you like," says King-Smith. "Bluetooth is a nice, easy way of connecting with a speaker. Once you've connected to one speaker via Bluetooth, you can use Wi-Fi to connect other speakers." This is a nod to convenience; no one is suggesting that Bluetooth be used to produce audiophile-quality music. Spotify Connect is a new standard that allows a compatible wireless speaker to be controlled straight from the Spotify app on a smartphone or tablet. Much better than Bluetooth, Spotify Connect goes as high as 320kbps streaming quality, and, on some speakers, at least, it allows the same song to be streamed to two separate speakers in a multi-room audio system. Why are some systems closed and others not? Caskeid doesn't guarantee an open system, only a well synchronised one, but it does open the debate about the increasing limits of closed systems. So far almost all multi-room audio systems have been closed (we're looking at you Sonos and Bose) which means that if you want to add a new speaker or create a new zone, you have no option but to buy from the same brand. The advantage is that you can use one app to do everything, though there's no guarantee that the app will keep up with developments in streaming. Are there any other open standards for multi-room music? Yes – Qualcomm AllPlay. "AllPlay is an open platform, meaning consumers will be able to control compatible audio products from different brands at the same time," says Luan Vien, Global Marketing Manager at Lenco, whose new Wi-Fi-based PlayLink speakers will be among the first to use AllPlay. "This interoperability gives consumers maximum choice, which is a major advantage over other closed platforms [because] before too long we will see other smart home appliances appearing, and the potential for connectivity will become more and more important." This is, of course, the internet of things. Sonos and Bose might be happy to stay closed, but Panasonic is signed-up, announcing at CES in January that its new SC-ALL8 and SC-ALL3 wireless multi-room speaker systems will use Qualcomm AllPlay, alongside Fon, Medion (a division of Lenovo), Musaic, Altec Lansing, TuneIn and iHeartRadio. It's a 'smart media platform' that can stream music to multiple rooms from multiple sources including NAS drives and smartphone apps. AllPlay-ready speakers can handle lossless 24-bit/192 kHz music in formats such as FLAC, WAV, AIFF and ALAC. Quality audio and universal interoperability are the selling points, but it should also mean that AllPlay-based apps can also be used across different brands of wireless speakers. So fire-up the app that's designed for the Panasonic AllPlay speakers and you'll also be able to see and control AllPlay speakers from any other brand. Qualcomm appears to have the same attitude as Imagination, with Bluetooth also used to make the connection between devices (via one-touch NFC, naturally), but Wi-Fi used to spread the music around. "It's core to what we do," says Gary Brotman, Director, Product Management for the AllPlay Smart Media Platform at Qualcomm in SanDiego. "AllPlay operates as a P2P tech and takes music from a PC, a smartphone, or from the cloud and streams it to up to 10 AllPlay speakers synchronously and with no noticeable skew, latency or echo between zones or speakers. It can also do 10 individual streams to 10 speakers." AllPlay is also about keeping the Wi-Fi network strong. "If you don't have solid Wi-Fi in a speaker, it doesn't matter how good the quality is, how many content services you have integrated, or how many speakers you can stream to because you'll never hear it if the connectivity is poor," says Brotman. "That's a problem that has plagued many of the systems to date." Essentially an audio module, AllPlay is built on AllJoyn, an open source software framework initially built for smartphone gaming, instant communications and other functions where low-latency is crucial. AllJoyn is a technology that wants your music, then your home. "It's designed to be prevalent across the connected home," says Brotman. "Your washer-dryer, coffee maker, your door lock, your TV, speakers and even your router can all have AllJoyn." This is tech that's travelled down from smartphones to home electronics – and now speakers. "The internet of everything will only happen when there's a common language, because the basic ability of a gadget to talk to the cloud or have an IP address doesn't guarantee a user experience that's palatable or acceptable," says Brotman. "It's all totally open-source – Qualcomm doesn't own the code – and it's the basis for the 50-strong AllSeen Alliance." Qualcomm wants to get your feet wet with mutli-room music. "It's a fun and non-threatening way into the internet of everything," says Brotman. "There's no technical barrier." So can I play any song in any room? You can if you've downloaded it and own it as a MP3 or similar file, but if it's in the cloud, what you can do is hugely restricted. You can now attach several devices to a Spotify subscription, which wasn't always the case, but multiple audio streams aren't allowed. That's understandable from a licensing point of view; one person cannot listen to two songs simultaneously, so if they are, they must be sharing their account, which isn't allowed. However, it does place a restriction on multi-room music systems. "There's enormous confusion because both Sonos and now Caskeid are now talking about your abilities to listen to different music in different rooms, but actually the licences under which services like Spotify operate mean they can only supply a single stream of music to any one subscriber," says Silver. With the advent of Caskeid synchronisation and inter-operable wireless music standards like AllPlay, the technology is there for an exciting and flexible future for digital music, but the music industry, as ever, is still playing catch-up. Streaming music is only the start, the internet of things aims to make all everything connected.